In this week’s Mad Genius Tips video, F&W’s Justin Chapple demonstrates how to create cute, heart-shaped cupcakes using a muffin pan and marbles. Here, five delicious pink and white cupcake recipes to use when you try out this adorable trick. In this week’s special Valentine’s Day edition of Mad Genius Tips, F&W’s Justin Chapple demonstrates how to create cute, heart-shaped cupcakes using a muffin pan and marbles. Here, five delicious pink and white cupcake recipes to use when you try out this adorable trick. 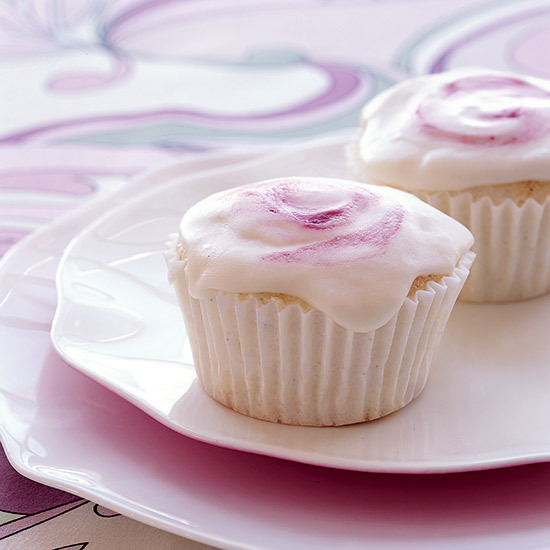 For a bright and beautiful pink, swirl strawberry jam into vanilla frosting. These terrifically moist and carroty cupcakes are topped with classic cream cheese frosting. For a super low-fat cupcake version of a jelly doughnut, fill vanilla-flecked angel food cupcakes with an easy homemade raspberry jam. These darling coconut flour cupcakes are topped with a creamy vanilla bean frosting. Shredded coconut enhances the coconut flavor and adds extra texture to every bite. Instead of frosting, these cupcakes are topped with sweet-tart lemon cream and fresh berries.